These are addictive! They can be made to anyone’s taste by adjusting the amount of heat. In a large bowl, combine cheese, butter or margarine, flour, crispy rice cereal, salt, Worcestershire sauce, garlic powder, cayenne pepper, and black pepper. Mix well and form small balls out of the dough (the dough will yield approximately 55 balls). Flatten each ball of dough with your fingertips until the dough is very thin and arrange the discs on a cookie sheet. 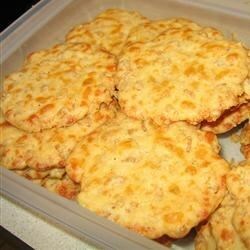 Bake for 12 minutes; or until the Cheese Crispies are golden and slightly brown around the edges. Enjoy!